Today, Thursday October 11th marks the birthday of Thich Nhat Hahn, a Buddhist monk, world peacemaker, illustrious writer, modern day Saint. This amazing soul is 92 years young today, and so to honor his life and teachings, I wanted to assemble a variety of quotes, articles, books, and links so that even more people could learn about this most precious of souls. Known as the father of modern Buddhism, Thich Nhat Hanh has been spreading his message of peace, compassion, and mindfulness since becoming a monk at the age of 16. Born in the village of Hue in central Vietnam in 1926, Thich Naht Hanh has said that he knew he wanted to be a monk by the age of seven. Although his parents were at first resistant to the idea, knowing it would bring about a life of ascetism and celibacy, they relented and allowed him to enter the monastery at the age of 16. And how much better the world is today for his inner-knowing of his true calling, and his parent’s encouragement. If you want to feel better about yourself, the world, and your place in it, watch his videos and follow his teachings. Miracles will follow. 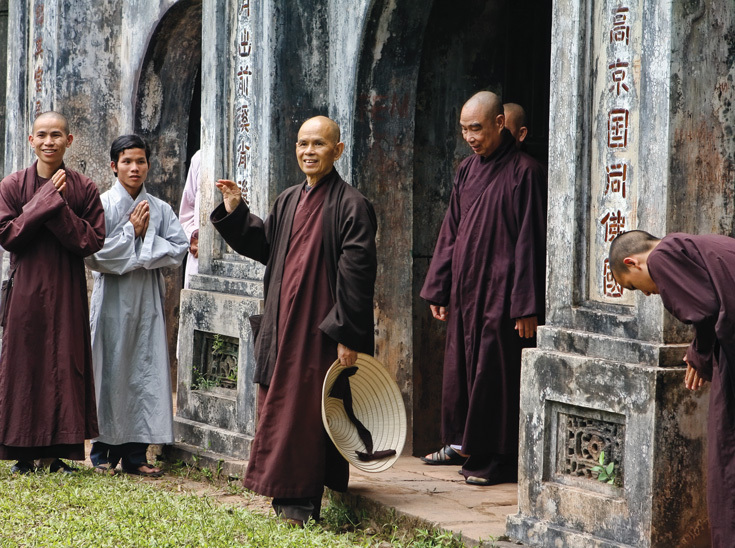 Thich Nhat Hanh has led a long life bookmarked by efforts of peacemaking and reconciliation. In 1961, he began teaching comparative religion at Princeton University, and soon thereafter became a strong voice in the anti-war movement, eventually traveling back to his homeland of Vietnam to continue aiding his community in protest of the Vietnam War. Returning back to the United States in 1966 to teach, it was this year that Thich Naht Hanh met Martin Luther King Jr. and bonded with the man over their shared beliefs over the importance of love, non-violence, and community. Later that year, Dr. King nominated Thich Naht Hanh for the 1967 Nobel Peace Prize. In his nomination Dr. King said, "I do not personally know of anyone more worthy than this gentle monk from Vietnam. His ideas for peace, if applied, would build a monument to ecumenism, to world brotherhood, to humanity." This public announcement of his endorsement broke tradition with the Nobel tradition, and so that year, the prize was not awarded, to Thay or anyone else, but Dr. Martin Luther King’s announcement introduced a new generation of Westerner’s to Thay’s teachings and life’s work. Thich Naht Hanh was eventually exiled from Vietnam for his peace-making efforts soon thereafter, and in exile formed the Plum Village Monastery in Southern France where he continues to live to this day. His life has been one marked through teaching and enlightenment, and he has spent his life helping thousands of students bth in the West and in the East learn the ways of compassion and enlightenment through his work, inspiring millions through his talks and presence on the world stage as a spiritual leader. “"I have noticed that people are dealing too much with the negative, with what is wrong. They do not touch enough on what is not wrong—it’s the same as some psychotherapists. Why not try the other way, to look into the patient and to see positive things, to just touch those things and make them bloom? Waking up in the morning, you can recognize “I’m alive” and that there are twenty-four hours for me to live, to learn how to look at living beings with the eyes of compassion. If you are aware that you are alive, that you have twenty-four hours to create new joy, this would be enough to make yourself happy and the people around you happy. This is a practice of happiness." Today, the best way to celebrate the life and livelihood of this most amazing yoda-like soul, is to continue your own meditation practice, and to be fully present in your body, and grateful for the life-force coursing through you in honor of dear Thay. Wherever you are in the world as you read this, I hope you can be inspired by the life of Thich Nhat Hanh to make the world a little bit of a better place by being at peace with yourself and working to spread that peace to others. I invite you to meditate today and learn more about his life and to be inspired by his teachings. I have assembled a brief list below of articles, podcast episodes, interviews, and books you can read and absorb. Be forewarned: reading his books and working to live the teachings of Thich Naht Hahn will surely change your life! You will be moved by his gentleness, and inspired by his life of compassionate peace. HBD Thich Nhat Hahn, you wise, wise soul. May we all be at peace with ourselves and in our world today in honor of your astounding legacy, touching joy as we realize the miracle of our own existence. I am so glad we continue to have you walking peacefully about our world, and thank you for the indelible mark you have made and continue to make on our world. Thay has written over 30 books in his lifetime, below are some of the books I recommend to start with. Consider buying from your local bookseller, from plumvillage.org itself, or borrowing from your local library to continue the tradition of equity and giving back. No Mud, No Lotus: The Art of Transforming Suffering. By Thich Nhat Hanh. Copyright 2014. Living Buddha, Living Christ. By Thich Nhat Hanh. Copyright 1995. At Home in the World, by Thich Nhat Hanh. Copyright 2016. Podcasts and videos to get you inspired and spiritually moved. Thich Nhat Hanh Dharma Talk on Breaking Bad Habits, Minfulness, Meditation, and Being at Peace with Oneself in the World. Thich Nhat Hanh’s shares with a young girl how to “let her anger out” in a healthy way. Buddhism is more of a way of life than a religion. It is like a fruit. You may like a number of fruits, like bananas, oranges, mandarins, and so on. You are committed to eating these fruits. But then someone tells you that there is a fruit called mango and it would be wonderful for you to try that fruit. It will be a pity if you don’t know what a mango is. But eating a mango does not require you to abandon your habit of eating oranges. Why not try it? You may like it a lot. Buddhism is a kind of mango, you see—a way of life, an experience that is worth trying. It is open for everyone. You can continue to be a Jew or a Catholic while enjoying Buddhism. I think that’s a wonderful thing." A great overview on Thich Naht Hanh’s life and outlook on Buddhism and self-care through interview. Thich Nhat Hanh Shares Advice on How to Make an Home Altar and sacred space for mindful breathing, meditation, and prayer. A beautiful piece. Thich Nhat Hanh shares a great Metta (lovingkindness) meditation for restoring a sense of peace and unity to ourselves and others, as well as advice for how to approach and deal with feelings of anxiety, anger, fear, and sadness. A great read with tons of information that you will want to refer back to. “I have a lot of time for myself. And that’s not easy. My nature is that I don’t like to disappoint people, and it is very difficult for me to say no to invitations. But, I have learned to know my limit, learned to say no and to withdraw to my hermitage to have time for my walking meditation, my sitting, my time with the garden, with the flowers and things like that. I have not used the telephone for the last twenty-five years. My schedule is free. It is a privilege. Sometimes I remember a Catholic father in Holland who keeps a beeper. I asked him, “Why do you have to keep that?” and he said “I have no right to be disconnected from my people.” Well, in that case, you need an assistant. Because you cannot continue to be of help to other people if you do not take care of yourself. Your solidity, your freedom, your happiness, are crucial for other people. Taking good care of yourself is very important. I have learned to protect myself. That does not mean that I have to be unkind to people, but sharing the teaching with helping professionals, well, I always say, “You work so hard. Doctors and nurses and social workers, you work too hard. And if you face so much stress, you cannot go on, you have burned out. So please find ways—by all means—in order to protect yourself. Come together and discuss strategies of self-protection. Otherwise you cannot help people for a long time.” Because I urge other people to do so, I do so myself.